Sorion has always prided itself on the quality of its products and our customer service. In 2007 we achieved accreditation to ISO9001. On the 7th September 2016 Sorion was re-assessed by Lloyds Register against the ISO9001:2008 standard and was awarded the standard, at this point Sorion committed to perform the transition to the new ISO9001:2015 standard during 2017. 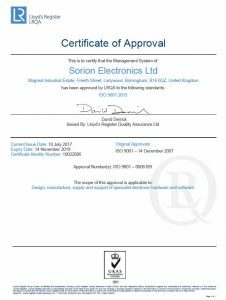 On the 15th June Lloyds Register assessed Sorion to the new standard and on the 10th July Sorion was awarded it’s certificate of approval.